The biggest problem with an elegant new artform is how do you describe it to possible prospects when you don’t have a sample to show them. It is hard to manage an elevator pitch when there is nothing like what you are trying to describe. The describing of something new by comparing it favorably or unfavorably to something else is called "positioning". Positioning lets a person understand a new topic in terms of one that is understood, as in, "Oh, so it tastes like chicken, only better!" You can’t just give something a new name and expect people to understand what it is. You can show them a photo of your new product, of course, but photos don’t always tell enough of the story. I ran into this some months ago when I asked Carter Holliday, veteran ceramicist, what exactly it was that he made in his studio. It took him several minutes of discussion and I STILL didn’t understand what he did. I went to his website and even then I couldn’t get a real idea of what made his product desirable. Finally, I saw some of his creations in the Bell Gallery in Floyd, VA, and was so impressed with the quality of Carter’s work that I immediately bought one as a gift for a family member. 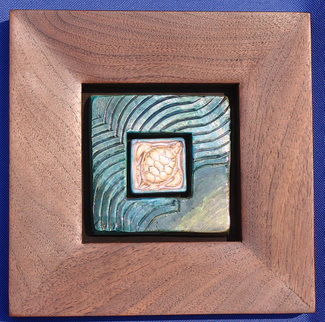 He describes this particular creation as an art tile, which is somewhat like describing a Mercedes 300SL Gullwing as a car. beautifully crafted bookmatched walnut frames. 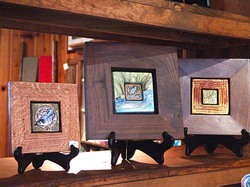 The workmanship is superb and these mounted art tiles would add an elegant touch to any home or office. Carter still hasn’t worked out what to call his "art tiles" but he soon won’t have to worry. People will begin asking for those "Carter Holliday Tiles" and he will have created his own genre. For the most part, unless a craftsperson makes a commonly recognized article like a cup, jug, or bowl, they have to use a description that decribes how it is formed or how it is used. In the case of Carter’s tile creations, he might have to use descriptions like "framed assemblies of carved art tiles" or something like that to give a prospect some idea of what to expect. I can tell you from my own experience that it will take some work to come up with a description that matches the reality of Carter’s work when you actually see it. We should all have such problems! I love the frame within the frame withing the frame… it’s like looking down into a well. Carters artwork is just beautiful and tactile….. your site is interesting … bright moments to you.